7 Years in Tibet is for me a good movie. I decided to draw a Mind Map while watching it. Here is the result, a hand made Map, incomplete and subjective, of course. I did it for keeping this movie in my memory and as a creativity practice. When you like something, in this case I found the movie good, it's easier to represent it or to speak about it. 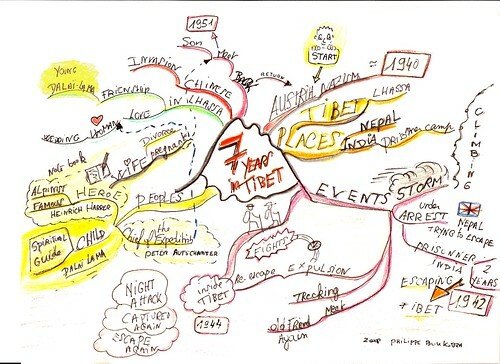 That's why mindmapping a movie you like could be an interesting Mind Mapping Techniques exercise. Great Map Philippe - and a wonderful film. The colours and keywords you have used take me back to the film instantly. What you have also highlighted here by completing this Mind Map is the reverse possibles - creating/writing a film from a Mind Map. Thank you Paul, I'm very proud of your comment.